It's a bright, sunny Sunday morning here in Jerusalem and the knife-borne hatred is, once again, out there and on display for anyone wanting to understand. Damascus Gate is one of the two major entrance/exit points for the Old City. Times of Israel, in a slightly more updated report, explains that the victim's injuries are not so light. He was stabbed in the neck and is said to have suffered light to moderate injuries, After emergency treatment at the site, he was rushed to the Hadassah hospital in Ein Karem. The attacker was shot and killed by officers at the scene. 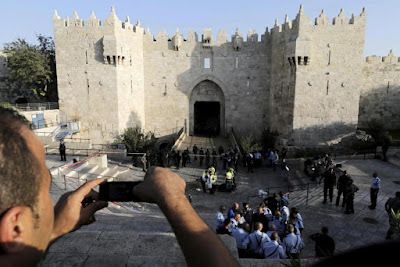 The same source reports that the attacker is a resident of Nablus - we call it Shechem in Hebrew, and the Damascus Gate is called Shechem Gate in Hebrew - aged 38. AFP says his name is Bassem Salah. Witnesses heard him shout "Allahu akbar" as he plunged the knife into the victim's body. A second knife was found concealed in his clothing, indicting thwarted plans for additional savagery. Unrelated - but of course related - there's security camera video [here] of an Israeli Border Guard officer being attacked from behind by an assailant with a knife in Nahariya, in Israel's north, on Friday night. The stabber turns out - yet again - to be a 16 year old Palestinian Arab boy.